It’s astonishing to see people who essentially confess to their complicity in criminal activities on camera. This can be a moment of true surprise where someone maintaining their innocence accidentally acknowledges a damning fact or revelation, unaware in the moment of just what it is that they have admitted. It can also be a free and unapologetic description of behavior or actions that may be against the laws of their land or another, one that they do not see as problematic because something much stronger is driving their words: a firm and uncompromising belief that what they are doing is right. Director Talal Derki, whose previous film, “Return to Homs,” won a number of film festival awards several years ago, returns to his home country of Syria, where he befriends General Abu Osama, a militant jihadist who raises his sons to become fighters in the war on the West in the name of his religion. Keeping his camera trained on Osama, Derki follows his family for two years as they reflect on what they’ve endured and prepare for the next phase of their jihad, with the ultimate goal that all of Osama’s offspring should one day carry out missions of their own to achieve victory. Osama is a remarkable subject, one who expresses his hatred for those who believe something different than him in an almost friendly, simply analytic manner. He celebrates the birth of one of his sons on September 11th as a fateful date, and proudly names his children after those who have died carrying out terrorist attacks, proclaiming his admiration for the Taliban. He believes so strongly in what he is doing, and it’s possible that his willingness to talk as much as Derki prompts him, and even beyond that, can be attributed to his desire to get his message out to the world, assuring them that he and those like him will never cave or stop fighting. This is the latest of a number of documentaries to come out of Syria, though this may be the most intimate and disturbing of them all, since it showcases someone who continues to advocate for violence under the guise of doing God’s work rather than working tirelessly either to survive or proactively end the conflict. 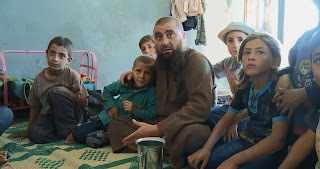 This unsettling film, which screened at DOC NYC and received a Film Independent Spirit Award nomination today, captures something that isn’t easy to convey and is even more difficult to understand: the perspective of someone perceived by most of the world as a terrorist who sees himself as a far nobler messenger of God.